Not to be confused with SimPy, a discrete-event simulation language. SymPy is a Python library for symbolic computation. It provides computer algebra capabilities either as a standalone application, as a library to other applications, or live on the web as SymPy Live or SymPy Gamma. SymPy is trivial to install and to inspect because it is written entirely in Python with few dependencies. This ease of access combined with a simple and extensible code base in a well known language make SymPy a computer algebra system with a relatively low barrier to entry. SymPy includes features ranging from basic symbolic arithmetic to calculus, algebra, discrete mathematics and quantum physics. It is capable of formatting the result of the computations as LaTeX code. SymPy is free software and is licensed under New BSD License. The lead developers are Ondřej Čertík and Aaron Meurer. The SymPy library is split into a core with many optional modules. Note, plotting requires the external matplotlib or Pyglet module. SymEngine: a rewriting of SymPy's core in C++, in order to increase its performance. Work is currently in progress to make SymEngine the underlying engine of Sage too. SfePy: Software for solving systems of coupled partial differential equations (PDEs) by the finite element method in 1D, 2D and 3D. galgebra: Geometric algebra module (previously sympy.galgebra). LaTeX Expression project: Easy LaTeX typesetting of algebraic expressions in symbolic form with automatic substitution and result computation. Since version 1.0, SymPy has the mpmath package as a dependency. gmpy: If gmpy is installed, the SymPy's polynomial module will automatically use it for faster ground types. This can provide a several times boost in performance of certain operations. 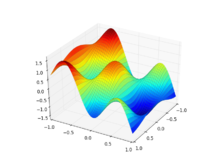 matplotlib: If matplotlib is installed, SymPy can use it for plotting. Sympy allows outputs to be formatted into a more appealing format through the pprint function. Alternatively, the init_printing() method will enable pretty-printing, so pprint need not be called. Pretty-printing will use unicode symbols when available in the current environment, otherwise it will fall back to ASCII characters. >>> # Alternatively, you can call init_printing() once and pretty-print without the pprint function. ^ "Release Notes for 1.3". ^ a b c "SymPy homepage". Retrieved 2014-10-13. ^ a b c Joyner, David; Čertík, Ondřej; Meurer, Aaron; Granger, Brian E. (2012). "Open source computer algebra systems: SymPy". ACM Communications in Computer Algebra. 45 (3/4): 225–234. doi:10.1145/2110170.2110185. ^ Meurer, Aaron; Smith, Christopher P.; Paprocki, Mateusz; Čertík, Ondřej; Kirpichev, Sergey B.; Rocklin, Matthew; Kumar, AMiT; Ivanov, Sergiu; Moore, Jason K. (2017-01-02). "SymPy: symbolic computing in Python". PeerJ Computer Science. 3: e103. doi:10.7717/peerj-cs.103. ISSN 2376-5992. ^ "Sympy project statistics on Open HUB". Retrieved 2014-10-13. ^ Gede, Gilbert; Peterson, Dale L.; Nanjangud, Angadh; Moore, Jason K.; Hubbard, Mont (2013). "Constrained multibody dynamics with Python: From symbolic equation generation to publication". ASME 2013 International Design Engineering Technical Conferences and Computers and Information in Engineering Conference. American Society of Mechanical Engineers: V07BT10A051. doi:10.1115/DETC2013-13470. ISBN 978-0-7918-5597-3. ^ Rocklin, Matthew; Terrel, Andy (2012). "Symbolic Statistics with SymPy". Computing in Science & Engineering. 14 (3): 88–93. doi:10.1109/MCSE.2012.56. ^ Asif, Mushtaq; Olaussen, Kåre (2014). "Automatic code generator for higher order integrators". Computer Physics Communications. 185 (5): 1461–1472. arXiv:1310.2111. Bibcode:2014CoPhC.185.1461M. doi:10.1016/j.cpc.2014.01.012. This page was last edited on 10 April 2019, at 16:43 (UTC).